All last week, I kept looking at Specimens and thinking of mandalas — which makes perfect sense, since the brooch pictured at the top of that painting is one I embroidered with mandalas in mind. So when it came time to rework this particular picture, of course I had to do a mandala. I’ve noticed that every time I try to draw a mandala, I very quickly get bored with just going around and around in circles. Often I’ll combat this by introducing radiating lines, and I did that here as well — perfectly echoing the design of the original brooch. Even though this is a painting of jewelry, there are a lot of textiles involved. I tend to like adornments that combine soft things with harder, glossier metal and gemstones, and so there’s much more fabric and thread in my jewelry box than in most people’s! The pink radiating lines are running stitches (interspersed with beads), and the black frondlike things come from a fabric necklace. I also added other bits from the necklace’s printed fabrics, and seed pearls and pink and blue French knots from a Japanese embroidered brooch. At this point, even the radiating lines were getting swallowed back into a tight concentric form, so I had to decide what to do next. I opted for yet another dose of radiating lines, this time mimicking the tiny chains on the necklace in the original painting. I’m really happy with how those came out — not just the tiny links but also their undulating arrangement, which was freehand like everything else in this piece. I admit, by this time I was getting tired: tired physically of painting such tiny shapes, but also mentally tired of figuring out what to paint next and where to place it. So I decided I was done. Then I remembered to check the mandala against the original painting, to make sure I’d included each piece of jewelry that was in the original. Good thing I checked! I’d left out my hair ornament. It seemed too complicated to try to fit it in at this late stage, so I just added a little fillip of its maroon color to each of the radiating black “fronds.” There: done. Actually I like those little plumes of red — they give a dollop of fine feathery attitude, next to those brassy chains. 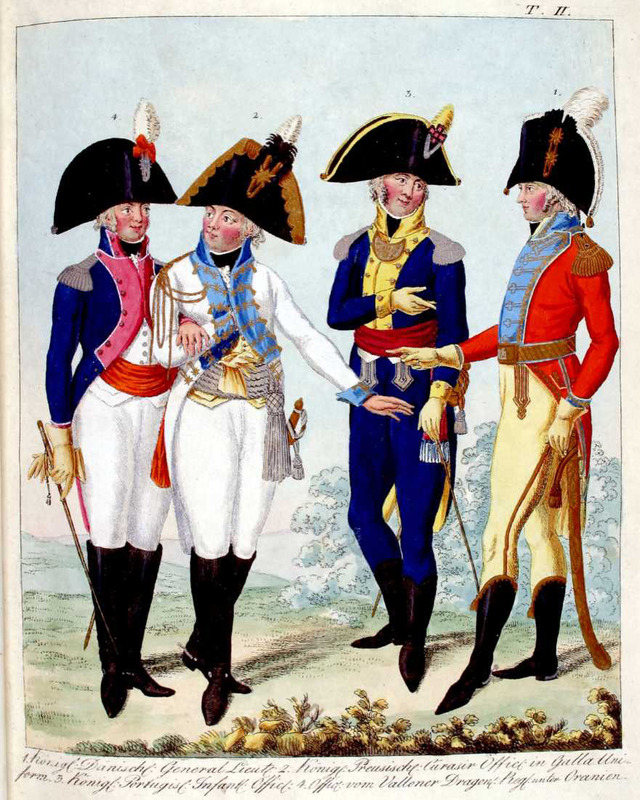 They remind me of the military uniforms of a bygone era… you know, like Napoléon. I really like this painting, though I don’t think it shows to advantage on the big sheet of paper. It’s such a dainty little piece, it gets lost amid all the bolder shapes and colors. But just by itself, I love it. And I think it looks even more jewelry-like than the original painting, even though that one clearly depicts jewelry! I think it’s that that one merely represents actual jewelry, whereas this one is a kind of fantasy of what jewelry should be. I wish I could wear it. *I’m thinking particularly of a 1787 Sèvres bowl I sketched in July at the Met, though actually, that bowl has much more muted colors and a design so simple that the makers weren’t sure it was appropriate (the factory owner fretted that it was “barbaric” to leave it ungilded!). But I remember, while drawing it, just how taken I was with its fineness. Thanks! It was really pleasing to do. I don’t know what I expected it to look like, but it wasn’t this (and yet it sort of was, maybe?). There is always some surprise in making mandalas. Fabulous!!! I Love what you are doing. This one is gorgeous and I liked how you told us about the development of the piece.. Loved the concept, the execution, the thought process, and of course, the result! It looks amazingly jewel-like!